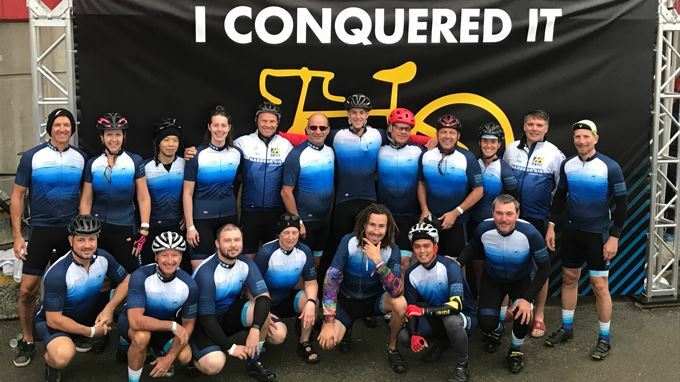 August 25th and 26th, 2018, Harbour Air employees, friends and family members came together as a team to participate in the 10th annual British Columbia Ride to Conquer Cancer (RTCC). The airline’s 26-member team set a new company record, raising more than $80,000 in donations for the charity event. Marking the 10-year milestone, the RTCC featured a new, completely B.C.-based route for 2018. Over 2,500 cyclists from across the province rode 200 scenic kilometres over two days in BC’s Fraser Valley, and collectively raised $10.6 million in support of the BC Cancer Foundation. In addition to team fundraising efforts, Harbour Air was proud to support the 2018 British Columbia Ride to Conquer Cancer as a Peloton Partner sponsor. Sponsorship contributions assisted with ride operations and a new Harbour Air lounge to greet tired riders back to camp with lounge chairs, games and activities. In the months leading up to the ride, Harbour Air team members and employees collected personal donations, hosted charity BBQ events and assisted with securing corporate fundraising. Working towards a total besting the team’s 2017 contribution of $65,000, the Harbour Air riders celebrated breaking the $80,000 milestone mid-way through the ride’s first day. Harbour Air’s Ride to Conquer Cancer team and corporate sponsorship align with the company’s Share the Fare charitable giving program. Introduced in 2017 and raising over $75,000 in its first year, Share the Fare is Harbour Air’s way of giving back to the coastal BC communities that have supported the airline for over 35 years. For each passenger travelling on a “Share the Fare Friday,” Harbour Air automatically makes a $1 donation. Passengers also have the opportunity to make their own contributions on any flight, any day. Share the Fare proceeds are divided evenly between three local charity partners: Canuck Place Children’s Hospice, The BC Cancer Foundation and the Boys & Girls Club of South Coast BC. Harbour Air would like to thank everyone who contributed donations or personal time to the make the 2018 Ride to Conquer Cancer a resounding success. In addition, a debt of gratitude is owed to the ride organizers and crew, the ever-smiling volunteers, traffic control professionals, police and patient motorists for a safe, fun and memorable event. Thank you and see you next year!